Arthur was born at Buckingham Palace on 1 May 1850, the seventh child and third son of Queen Victoria and Prince Albert of Saxe-Coburg and Gotha. The prince was baptised by the Archbishop of Canterbury, John Bird Sumner, on 22 June in the palace's private chapel. His godparents were Prince William of Prussia (the later King of Prussia and German Emperor Wilhelm I); his great-uncle's sister-in-law, Princess Bernard of Saxe-Weimar-Eisenach (for whom his maternal grandmother the Duchess of Kent stood proxy); and the Duke of Wellington, with whom he shared his birthday and after whom he was named. As with his older brothers, Arthur received his early education from private tutors. It was reported that he became the Queen's favourite child. It was at an early age that Arthur developed an interest in the army, and in 1866 he followed through on his military ambitions by enrolling at the Royal Military College at Woolwich, from where he graduated two years later and was commissioned as a lieutenant in the Corps of Royal Engineers on 18 June 1868. The Prince transferred to the Royal Regiment of Artillery on 2 November 1868 and, on 2 August 1869, to the Rifle Brigade, his father's own regiment, after which he conducted a long and distinguished career as an army officer, including service in South Africa, Canada in 1869, Ireland, Egypt in 1882, and in India from 1886 to 1890. In Canada, Arthur, as an officer with the Montreal detachment of the Rifle Brigade, undertook a year's training and engaged in defending the Dominion from the Fenian Raids; there was initially concern that his personal involvement in Canada's defence might put the Prince in danger from Fenians and their supporters in the United States, but it was decided his military duty was primary. Following his arrival at Halifax, Arthur toured the country for eight weeks and made a visit in January 1870 to Washington, D.C., where he met with President Ulysses S. Grant. During his service in Canada he was also entertained by Canadian society; among other activities, he attended an investiture ceremony in Montreal, was a guest at balls and garden parties, and attended the opening of parliament in Ottawa (becoming the first member of the royal family to do so), all of which was documented in photographs that were sent back for the Queen to view. It was not, however, all social and state functions for Arthur; the Prince was on 25 May 1870 engaged in fending off Fenian invaders during the Battle of Eccles Hill, for which he received the Fenian Medal. Arthur made an impression on many in Canada. 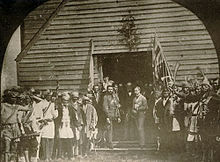 He was given on 1 October 1869 the title Chief of the Six Nations by the Iroquois of the Grand River Reserve in Ontario and the name Kavakoudge (meaning the sun flying from east to west under the guidance of the Great Spirit), enabling him to sit in the tribe's councils and vote on matters of tribe governance. As he became the 51st chief on the council, his appointment broke the centuries-old tradition that there should only be 50 chiefs of the Six Nations. Of the Prince, Lady Lisgar, wife of then Governor General of Canada the Lord Lisgar, noted in a letter to Victoria that Canadians seemed hopeful Prince Arthur would one day return as governor general. Arthur was promoted to the honorary rank of colonel on 14 June 1871, substantive lieutenant-colonel in 1876, colonel on 29 May 1880 and, on 1 April 13 years later, was made a general. He gained military experience as Commander-in-Chief of the Bombay Army from December 1886 to March 1890. He went on to be General Officer Commanding Southern District, at Portsmouth, from September 1890 to 1893. The Prince had hoped to succeed his first cousin once-removed, the elderly Prince George, Duke of Cambridge, as Commander-in-chief of the British Army, upon the latter's forced retirement in 1895. But this desire was denied to Arthur, and instead he was given, between 1893 and 1898, command of the Aldershot District Command. In August 1899 the 6th Battalion, Rifles of the Canadian Non-Permanent Active Militia, located in Vancouver, British Columbia, asked Prince Arthur to give his name to the regiment and act as its honorary colonel. The regiment had recently been converted to the infantry role from the 2nd Battalion, 5th British Columbia Regiment of Canadian Artillery. With the Prince's agreement the unit was renamed 6th Regiment, Duke of Connaught's Own Rifles (DCORs) on 1 May 1900. He was subsequently appointed colonel-in-chief of the regiment, then known as The British Columbia Regiment (Duke of Connaught's Own), in 1923. He held that appointment until his death. On 26 June 1902 he was promoted to the post of field marshal, and thereafter served in various important positions, including Commander-in-Chief of Ireland, from January 1900 to 1904, with the dual position of commander of the Third Army Corps from October 1901, and Inspector-General of the Forces, between 1904 and 1907. On his mother's birthday (24 May) in 1874, Arthur was created a royal peer, being titled as the Duke of Connaught and Strathearn and Earl of Sussex. Some years later, Arthur came into the direct line of succession to the Duchy of Saxe-Coburg and Gotha in Germany, upon the death in 1899 of his nephew, Prince Alfred of Edinburgh, the only son of his elder brother, Prince Alfred, Duke of Edinburgh. He decided, however, to renounce his own and his son's succession rights to the duchy, which then passed to his other nephew, Prince Charles Edward, the posthumous son of Prince Leopold, Duke of Albany. At St. George's Chapel in Windsor Castle, on 13 March 1879, Arthur married Princess Louise Margaret of Prussia, the daughter of Prince Frederick Charles and a great-niece of the German Emperor, Arthur's godfather, Wilhelm I. The couple had three children: Princess Margaret Victoria Charlotte Augusta Norah (born 15 January 1882), Prince Arthur Frederick Patrick Albert (born 13 January 1883), and Princess Victoria Patricia Helena Elizabeth (born 17 March 1886), who were all raised at the Connaughts' country home, Bagshot Park, in Surrey, and after 1900 at Clarence House, the Connaughts' London residence. 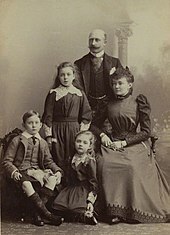 Through his children's marriages, Arthur became the father-in-law of Crown Prince Gustaf Adolf of Sweden; Princess Alexandra, Duchess of Fife; and Sir Alexander Ramsay. Arthur's first two children predeceased him; Margaret while pregnant with his sixth grandchild. [n 1] For many years, Arthur maintained a liaison with Leonie, Lady Leslie, sister of Jennie Churchill, while still remaining devoted to his wife. Alongside his military career, he continued to undertake royal duties beyond, or vaguely associated with, the army. On the return from a posting in India, he again, this time with his wife, toured Canada in 1890, stopping in all major cities across the country. He also toured Canada in 1906. In 1910, Arthur travelled aboard the Union-Castle Line ship Balmoral Castle to South Africa, to open the first parliament of the newly formed union, and in Johannesburg on 30 November he laid a commemorative stone at the Rand Regiments Memorial, dedicated to the British soldiers that died during the Second Boer War. When his brother was obliged to resign the office upon his accession in 1901 as King Edward VII, Prince Arthur was elected as Grand Master of the United Grand Lodge of England and was subsequently re-elected as such an additional 37 times before 1939, when the Prince was nearly 90 years of age. It was announced on 6 March 1911 that King George V had, by commission under the royal sign-manual, approved the recommendation of his British prime minister, H.H. Asquith, to appoint Arthur as his representative. 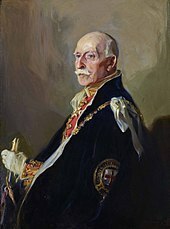 His brother-in-law, the Duke of Argyll, had previously served as the country's governor general, but when Arthur was sworn in on 13 October 1911 in the salon rouge of the parliament buildings of Quebec, he became the first Governor General of Canada who was a member of the British royal family. The Duke of Connaught with his staff in 1913. He was appointed as the Governor General of Canada from 1911 to 1916. To Canada, Arthur brought with him his wife and his youngest daughter, the latter of whom would become an extremely popular figure with Canadians. The Governor General and his viceregal family travelled throughout the country, performing such constitutional and ceremonial tasks as opening parliament in 1911 (to which Arthur wore his field marshal's uniform and the Duchess of Connaught wore the gown she had worn at the King's coronation the previous year) and, in 1917, laying at the newly rebuilt Centre Block on Parliament Hill the same cornerstone his older brother, the late King Edward VII, had set on 1 September 1860, when the original building was under construction. The family crossed the country a number of times and the Governor General made another trip to the United States in 1912, when he met with President William Howard Taft. When in Ottawa, Connaught maintained a routine of four days each week at his office on Parliament Hill and held small, private receptions for members of all political parties and dignitaries. The Duke learned to ice skate and hosted skating parties at the royal and viceroyal residence— Rideau Hall— to which the Connaughts made many physical improvements during Arthur's term as governor general. The royal family also took to camping and other outdoor sports, such as hunting and fishing. Prince Arthur and his viceregal party visit the Valcartier military base in 1914. In 1914, the First World War broke out, with Canadians called to arms against Germany and Austria-Hungary. Arthur maintained a wider role in the empire— for instance, from 1912 until his death, serving as Colonel-in-Chief of the Cape Town Highlanders Regiment— but the Connaughts remained in Canada after the beginning of the global conflict, with Arthur emphasising the need for military training and readiness for Canadian troops departing for war, and giving his name to Connaught Cup for the Royal Northwest Mounted Police, to encourage pistol marksmanship for recruits. He was also active in auxiliary war services and charities and conducted hospital visits. Though well intended, upon the outbreak of the war, Arthur immediately donned his field marshal's uniform and went, without advice or guidance from his ministers, to training grounds and barracks to address the troops and to see them off before their voyage to Europe. This was much to the chagrin of Prime Minister Robert Borden, who saw the Prince as overstepping constitutional conventions. Borden placed blame on the military secretary, Edward Stanton (whom Borden considered to be "mediocre"), but also opined that Arthur "laboured under the handicap of his position as a member of the royal family and never realised his limitations as Governor General." At the same time, the Duchess of Connaught worked for the Red Cross and other organisations to support the war cause. She was also Colonel-in-Chief of the Duchess of Connaught's Own Irish Canadian Rangers battalion, one of the regiments in the Canadian Expeditionary Force, and Princess Patricia also lent her name and support to the raising of a new Canadian army regiment— Princess Patricia's Canadian Light Infantry. His term as Canada's Governor General ended in 1916. Following the war, Arthur commissioned in memory of Canada's fallen a stained glass window which is located in St. Bartholomew's Church, Ottawa, next to Rideau Hall, and which the family attended regularly. Portrait by Philip de László, 1937. After his years in Canada, the Duke of Connaught and Strathearn held no similar public offices but undertook a number of public engagements. In 1921, he travelled to India, where he officially opened the new Central Legislative Assembly, Council of State, and Chamber of Princes. As president of the Boy Scouts Association and one of Lord Baden-Powell's friends and admirers, he performed the official opening of the 3rd World Scout Jamboree at Arrowe Park. The Duke also returned to military service and continued well into the Second World War, where he was seen as a grandfather figure by aspiring recruits. The Duchess, who had been ill during their years at Rideau Hall, died in March 1917, and Arthur mostly withdrew from public life in 1928; his last formal engagement was the opening of the Connaught Gardens in Sidmouth, Devon, on 3 November 1934. He died on 16 January 1942 at Bagshot Park, at the age of 91 years, 8 months and 15 days, the same age to the day as his elder sister, Louise, Duchess of Argyll, who had died three years before. A funeral service for the Duke was held at St George's Chapel, Windsor Castle on 23 January. after which his body was placed temporarily in the Tomb House beneath the Albert Memorial Chapel in Windsor. He was buried on 19 March 1942 in the Royal Burial Ground, Frogmore. He was the second last of Queen Victoria's children to die, with his younger sister Princess Beatrice dying two years later. As a member of the royal family and having been a viceroy, Prince Arthur held a number of titles and styles during his life. He was also the recipient of many honours, both domestic and foreign. He was an active member of the military, eventually reaching the rank of Field Marshal, and served as personal aide-de-camp to four successive sovereigns. Prince Arthur was granted a coat of arms with his dukedom, consisting of the escutcheon of the arms of the sovereign in right of the United Kingdom, with a difference of a label argent, of three points, the first and third bearing fleurs-de-lys azure, and the central a cross gules and an inescutcheon of Saxony. In 1917, the inescutcheon was dropped by royal warrant from King George V.
Quarterly 1st and 4th gules three lions passant guardant in pale or 2nd or a lion rampant gules within a double tressure flory counterflory gules 3rd azure a harp or stringed argent. Overall differenced by a label of three points argent, the central point charged with a St George's Cross, the points dexter and sinister charged with a Fleur-de-Lis azure. Until 1917, an inescutcheon of Saxony (for his father). Arthur's banner of arms between 1917 and 1942. Connaught Road, Hong Kong, a major thoroughfare on the north shore of Hong Kong Island. Rue Prince-Arthur [fr], a street in Montreal which is partly a pedestrian mall. ^ Through Princess Margaret, the reigning monarchs of Sweden and Denmark are descended from the Duke of Connaught and Strathearn. ^ "No. 21108". The London Gazette. 26 June 1850. p. 1807. ^ a b c d e f Bousfield, Arthur; Toffoli, Gary (2010). Home to Canada: Royal Tours 1786–2010. Tonawanda: Dundurn Press. p. 80. ISBN 978-1-55488-800-9. ^ Erickson, Carolly (15 January 2002). 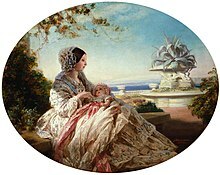 Her Little Majesty: The Life of Queen Victoria. New York: Simon & Schuster. ISBN 978-0-7432-3657-7. ^ "No. 23391". The London Gazette. 19 June 1868. p. 3431. ^ "No. 23436". The London Gazette. 30 October 1868. p. 5467. ^ "No. 23522". The London Gazette. 3 August 1869. p. 4313. ^ "No. 23751". The London Gazette. 30 June 1871. p. 3006. ^ "No. 24849". The London Gazette. 29 May 1880. p. 3269. ^ India Office (1819). The India List and India Office List. London: Harrison. Retrieved 7 July 2013. ^ a b "Army Commands" (PDF). Retrieved 21 November 2015. ^ "No. 26084". The London Gazette. 2 September 1890. p. 4775. ^ "No. 26458". The London Gazette. 14 November 1893. p. 6356. ^ "No. 26446". The London Gazette. 3 October 1893. p. 5554. ^ "No. 27154". The London Gazette. 16 January 1900. p. 289. ^ "No. 24098". The London Gazette. 26 May 1874. p. 2779. ^ "House Laws of the Saxe-Coburg and Gotha". Heraldica.org. ^ King, Greg (2007). Twilight of Splendor: The Court of Queen Victoria During Her Diamond Jubilee. Hoboken: John Wiley & Sons. p. 59. ISBN 978-0-470-04439-1. ^ Cox, Martin. "Union-Castle Line – A brief Company History". Maritime Matters. Archived from the original on 17 September 2008. Retrieved 28 September 2008. ^ "The Anglo-Boer War Memorial at the Museum of Military History". The All at Sea Network. Archived from the original on 18 September 2008. Retrieved 28 September 2008. ^ a b Office of the Governor General of Canada. "Governor General > Former Governors General > Field Marshal His Royal Highness the Prince Arthur, Duke of Connaught and Strathearn". Queen's Printer for Canada. Retrieved 30 April 2009. ^ "History – Past Royal Connections". Cape Town Highlanders Website (Unofficial). Archived from the original on 8 October 2007. Retrieved 28 August 2008. ^ Hubbard, R.H. (1977). Rideau Hall. Montreal and London: McGill-Queen's University Press. pp. 8–9. ISBN 978-0-7735-0310-6. ^ Borden, Robert (1 January 1969). Memoires. 1. Toronto: McClelland and Stewart. pp. 601–602. ^ "The Late Duke of Connaught". The Times (49189). London. 20 March 1942. p. 7. ^ "Duke Of Connaught Dead In England, 91. Last of Four Sons of Queen Victoria, Governor General of Canada, 1911-16. King Orders Mourning. Senior Field Marshal of the British Army Had a Notable Career in Armed Forces". New York Times. 17 January 1942. p. 8. ^ Coincidentally this was exactly the same age at which his elder sister, Princess Louise, Dowager Duchess of Argyll, died, making them jointly the two longest-lived of Queen Victoria and Prince Albert's nine children with him being the longest-lived living at almost 92. ^ "British Royalty Cadency". Heraldica. Retrieved 27 April 2010. Wikimedia Commons has media related to Prince Arthur, Duke of Connaught and Strathearn. Wikisource has the text of The New Student's Reference Work article about "Prince Arthur, Duke of Connaught and Strathearn". "Archival material relating to Prince Arthur, Duke of Connaught and Strathearn". UK National Archives. 8 May 1915, newspaper coverage of the Duke of Connaught's appearance at McGill University Convocation.